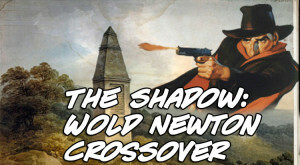 In this weeks episode I will be discussing The Shadow Over Innsmouth, it’s a crossover comic that puts The Shadow and Margo Lane in Innsmouth, from the story The Shadow Over Innsmouth by H.P. Lovecraft. The cleverly titled one-shot issue came out this week and is written by Ron Marz and illustrated by Ivan Rodriguez. This is going to be a somewhat negative review, as far as the story goes. The artwork by Ivan Rodriguez is amazing and I hope to see him on future Shadow and pulp projects from Dynamite, but the choices made in regards to the storyline didn’t do it for me. This is most likely due to my own preconceived notions about what genre the story would actually be in, but I was disappointed non-the less being more of a Lovecraft fan than a Shadow fan. I like the Shadow a great deal, but I am more fond of Lovecraft’s mythos.